LONDON (AP) - Three photographs of Prince Philip, never seen before by the public, are showing at a new exhibition celebrating his 90th year. 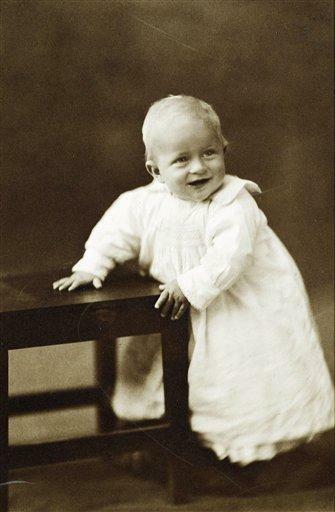 The exhibition, opening Saturday at Windsor Castle, opens with the first photograph taken of the infant Philip, who later became the husband of the present Queen Elizabeth II. The black and white print shows Philip as a newborn in the arms of his mother Alice of Greece. Another print from 1922 shows the prince holding up himself on the table while a third image shows Philip in his school photograph in 1933. The photo was taken after his family went into exile following a military coup in Greece. Philip, the oldest serving spouse of a reigning monarch, announced last year he would stepping down from some of his duties.